Happy Thanksgiving! As the holiday is upon us I wanted to thank you all for your faithful reading and support! 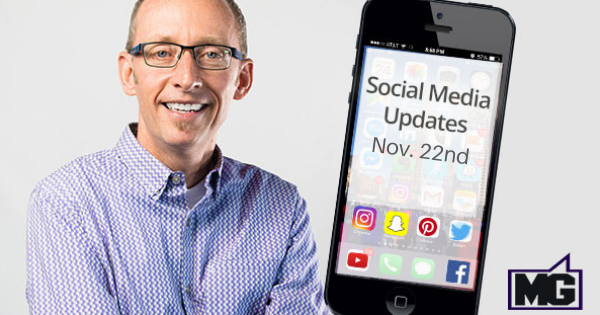 Here are some of the latest social media updates from the past two weeks. Communal (think “Group”) video viewing has been important for Facebook as a way to potentially connect users together and increase time on the platform, and they are testing another new video feature in Messenger. This feature would allow the members in the chat to receive a notification when the co-viewing is starting, see who’s watching, and control the video. This is a key test by Facebook to see how group video content can work on the platform. Not just content, but group video viewing. It’s like watching a TV show together but you may not be in the same physical space. Of course Facebook will want to monetize it so we’ll have to see how ads may be used, but businesses should view it from the angle of the video, (can you do video offering like this that attracts groups? ), and from the potential ads destination perspective. Just in time for the holiday season, Instagram has launched three new features: shopping collections, shop on business profiles, and shopping tags in videos for on-platform shopping. Shopping collections is a new section added to your profile where you can save products you’re interested in. This is just like Instagram’s ‘Save’ feature but with a focus on shopping. Now it’s easy to save items for later and keep your wish list up to date. Instagram’s business profiles have a new ‘Shop’ tab that features all your shopping-tag enabled posts. This allows users to be able to browse products in one area instead of scrolling through all on the posts. Similar to shopping tags for images, Instagram now allows businesses to have a listing of the products featured in the video. You can tap the shopping icon in the bottom left corner of the video to see the featured products and learn more about them. Social commerce continues to grow! What it, learn from it, and be ready to see how your business may be able to jump in as the tools and adoption evolve. The deals on Snapchat’s new Discover channel ‘Shop and Cop’ appear for a two-hour time limit. Users will be prompted to subscribe to channels to be made aware of the offers in “Shop and Cop.’ This new channel adds another way to build your audience’s awareness for your product and boost engagement. It’s another foray into e-commerce for SnapChat and another advancement or attempt at mobile commerce. Mobile commerce in apps is growing and it’s good to stay alert and in touch with this trend. Want to stay on top of the latest topics, movies, slang and more? Snapchat’s younger audience tends to have a large influence on key topics and content that flow through other platforms later. This latest update of trending topics can also be useful for your business to stay alert to news and trends. By staying on top of what Snap users are discussing you can use that data to determine the content your business/product uses to reach younger audiences. Since they are early-adopters it can give your business insight into coming trends and opportunities or changes your business may want to consider. New LinkedIn Pages now have updated sharing options and improved management tools. Mobile management tools now allow you to post via mobile which had been limited in the past. Since LinkedIn has given more access to management tools and sharing options, it gives you more ways to follow your LinkedIn performance and engagement. That’s a wrap on some of the latest updates from the last 2 weeks in the social media realm. It’s been a busy one! Subscribe to my blog via email to have these updates delivered to your inbox!